Gratitude to Doron Hanoch for sharing these practices so we can all breathe easier! Learning to use tools of yoga for asthma changed my life. The practices that helped me can help anyone breathe better, even those who don’t have asthma. Asthma can be triggered for different reasons, and different things will help different people, but some basic yoga practices are ideal if you want to breathe better. The practices and recommendations below are not a substitute for conventional medicine or a doctor, but they may help reduce the need for allopathic treatment. Please use wisdom and caution, and mostly, be patient. Scientists as well as yogis have studied this breathing technique of one-to-two breathing. They found that when the exhalations are longer than the inhalations, the parasympathetic system is activated, which activates the immune system and calms the nervous system. Taking longer exhales also helps muscles relax, making it effective in stress management as well as in reducing asthma symptoms. Yoga for asthma is not just about doing pranayma practices. Being calm helps improve asthma symptoms as well. Any time we can focus our awareness on a calming object of meditation, it helps us reduce stress, and allows the airway passages to relax and open. The one-to-two breathing technique will help with this. In addition, learning to keep the mind steady or softly focused on an object of meditation helps us gain better control of our mind. It is helpful to practice meditation in a calm environment so if you find yourself in a more chaotic situation later, you can tap into that ease and calmness and return to a balanced state. Method of Practice: Sit or lie down in a comfortable position. I recommend sitting, as there is a tendency to fall asleep when lying down. Choose an object of meditation. Classic Zen practice is to focus on your breath. This is helpful as it teaches us to slow the breath. Maybe even begin to notice the short pauses that occur at the end of the exhalations. Simply by having our awareness on the breath and allowing ourselves to just be, we become calm. If the mind is racing, notice it, and return to the breath. 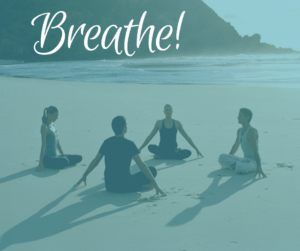 Over time, you will manage to stay with the breath for longer periods. You may prefer looking at a candle or a flower. You may even listen to a mantra or some relaxing music. However be sure your object of meditation is not distracting you. It should be neutral enough that you can stay focused on it. These are just a few examples of techniques that work great for most people. Other breathing techniques, such as viloma, sitali or nadi shodhana may help, as well as other meditation practices. I expand on these techniques and many other beneficial lifestyle practices in my book, The Yoga Lifestyle. Another lifestyle tip for better breathing is to eat an anti-inflammatory diet. For example, add turmeric to dishes whenever possible and eat daikon and radishes. Reduce or eliminate dairy, sugar, and gluten as these foods promote inflammation. Asthma tends to be defined by its symptoms, and most medicine is designed to alleviate the symptoms. However when we look at the entire mind, body, and spirit and learn to live a balanced, healthy lifestyle, we can get rid of or reduce many symptoms. A yoga lifestyle is ideal for doing just that. Just make sure to take yoga as a holistic practice; remain soft and have patience. You may need to keep using allopathic medicine, but hopefully, like me, you will find you can use it less. Doron Hanoch is a master yoga teacher and yoga lifestyle coach, a trained chef and certified nutritionist, and a longtime student of Zen. He is author of The Yoga Lifestyle: Using the Flexitarian Method to Ease Stress, Find Balance and Create a Healthy Life. Doron is currently building a yoga and Zen center in Guatemala.